The story of Jackie Robinson is one of the most significant stories in terms of cultural impact in the history of our country. He transcended baseball, sports, and the ignorant views of the time. It stands to reason that there should be a film worthy of telling that story to the masses who may only know general vagaries about it. 42 is not that film. To be fair, this was an uphill battle from the start. There was so much to tell, so much struggle, and triumph, that it was a daunting task to accomplish in a mere 2 hours. 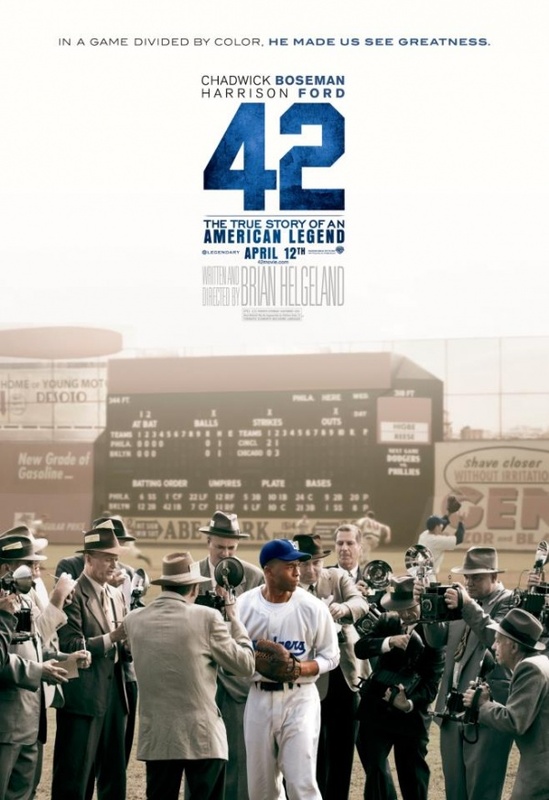 Excuses aside, 42 does an injustice to what Jackie Robinson was and what he stood for. The sheer historical significance of who he was automatically makes this film stirring and emotional, but the film itself lends absolutely nothing to the equation. First things first – the baseball scenes were atrocious. Anyone who calls this a baseball movie should go back to enjoying the rousing baseball skills of Brendan Fraser in The Scout. For starters, we never see the guy who is supposed to be Jackie Robinson swing the bat, or actually throw a ball. To rub salt in the wound, Robinson was one of the smoothest baserunners in history, yet the guy playing him looked like the awkward kid in gym class trying just hard enough to get a passing grade. I can’t stress how much this takes away from the film and no amount of clever editing truly fixes it. This is why Kevin Costner and Charlie Sheen are in every baseball movie ever made…they can actually look the part when they set foot on the diamond. To top it all off, we are made to believe that Branch Rickey basically picked Jackie Robinson out of a stack of files of black ballplayers and that it had nothing to do with how good he truly was. They make it seem like he was interchangeable and it is downright offensive to imply so. Once I came to grips with this not being a baseball film, I was able to turn my attention elsewhere. The pacing of the film was terrible, with random hits by Robinson strung together and spliced between speeches by Branch Rickey, and an awkward chronological recital of certain events. There were a few extremely uncomfortable scenes with streams and rants of racial slurs, but aside from those, the film was tame and a bit “Disney-ish”. Capturing the true bigotry Robinson had to endure was a seemingly impossible task. Sure it was prevalent in the film, but my guess was that it was much, much worse. It also neglected to focus on the hell that Robinson’s wife had to endure, showing her more as his support as opposed to her experiencing it right along with him. Now for the good…Harrison Ford is as good in his role as Branch Rickey as he was in any film he’s been in. Yes, the Star Wars nerds can mock me for saying that, and the Indiana Jones fans will scoff at the notion. Simply put, Harrison Ford should be nominated for an Oscar for his performance in 42. Putting together such a noteworthy performance is a good thing, but when you have a relative unknown in Chadwick Boseman (Robinson) next to you, it takes the focus away from him. This is why I felt like Branch Rickey was portrayed as a much larger focus of this film, taking away from everything Robinson had to endure. Major League Baseball is taking scores of kids to see this film so they can impart the heritage of the game so they know about Robinson’s legacy and what he meant to the game and our society. It’s a noble idea, however, they’d be better off giving those kids a book about Robinson since I worry they won’t truly appreciate him if this film is all they will know. I know I didn’t live through that time so it may be harder for me to connect, but I would think people that did would want better than 42 provided.